The U.S. Military and their family members go through hardships many of us can’t imagine. Being away from home, separated from those you love, is a huge sacrifice that we ask of many of the men and women protecting our country. They fight for freedom so that we can live day in and day out away from imminent danger and threats. 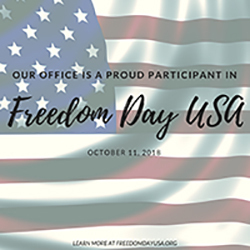 Freedom Day USA was founded to celebrate veterans, active military, and their immediate family members and to offer free services for one day a year. Our Brighton dentists and staff at Bromley Park Dental are proud to participate in the 2018 Freedom Day USA on October 11th, when we’ll offer free general dentistry services. What is Freedom Day USA? This annual event is “America’s Largest Military Thank You Event,” which started with offering basic dental services to those who have or are currently serving in the military and their immediate family. Freedom Day has expanded to other areas of health care and business, giving military members and their families various frees services, gifts, and special offers. Military health care typically doesn’t provide dental insurance, making oral health a big issue for the men and women fighting for us at home and overseas. Many of whom have gone years without a dental exam and cleaning. The mission of Freedom Day is to not only provide these services on a complimentary basis but also to start a conversation for change. Those serving our country should not have to put their dental health on hold. Active military, veterans, and their immediate family members can call our dentistry office in Brighton at (303) 558-5870 to schedule an appointment on Freedom Day. Our dentists and experienced dental staff are proud to be participating in this year’s event and serve patients in Brighton, Thornton, Commerce City, Fort Lupton, and surrounding areas of Colorado.